This is Rohan. He is not interested in the usual set of professional courses like the ones mentioned above. Do you think he can try his hand at something else? 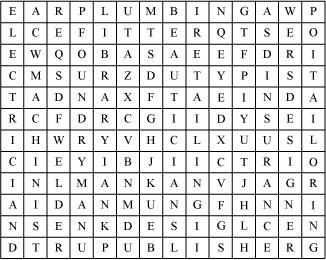 Work in pairs and try to find some courses that he may like from the word maze given below. Now that you have identified a few of the courses that Rohan can do, can you guess what would be their job profile and what category they can be placed under? 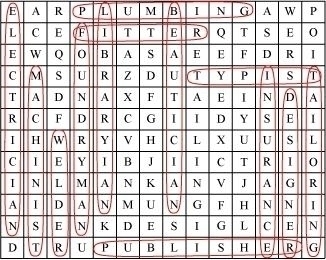 Given below is a table with jobs in column A and the job profile in column B (Jumbled up). Work in pairs to match the column A with column B and column C.
A tradesperson who specializes in installing and maintaining systems used for potable (drinking) water, sewage, and drainage. A person who works in a factory that produces metal castings. A person who sells goods directly to the consumer. A person who crafts clothes, furniture, crockery etc. An information professional trained in the organization and management of information services or materials for those with information needs. A person who makes, repairs, or alters clothing professionally, especially suits and men's clothing. A person who is in the business of rearing of silkworms for the production of raw silk. 1.3 Generally at the ________________________________________ level. "Education Curriculum requires fresh perspective"
Your school is planning to close down two vocational courses at + two level as the enrolment has not been very encouraging. However, the school has decided to hold a debate concerning this issue. The team that is able to convince the students will be the deciding factor for the courses. "Education should be skill based rather than knowledge based"
A Chairperson, Debate Secretary and Time keeper will be appointed to conduct the debate. Your school has decided to introduce Mass Media Studies as a subject under the vocational stream. This is going to help students who want to pursue a career in films, its production and other attached fields. Write a notice for your school notice board informing all students who are studying in class X regarding the course. Rahul iis not only your co worker but also a good friend. When you see him working with so much diligence and dedication, you feel happy at having supported him when his father was against him learning to be a Machinist. Write a narrative piece on Rahul's journey of self realization and success and how your support helped him achieve his ambition. Main Course Book (MCB) - English : CBSE NCERT Exercise Solutions & Summary for Class 10th for Unit-2 Vocational Education will be available online in PDF book form soon. The solutions are absolutely Free. Soon you will be able to download the solutions.